And hey, if you do try it out or buy the game, please let us know what you think of it. Oh, and if you have questions on the art, I’d be happy to talk about what we did and how… as long as it’s not proprietary information. Working in games always means doing more with less (we don’t have the luxury of Pixar-level render farms and making one frame a week), but this particular project really pushed what I thought I could get away with when it comes to making things work. Previously, I’ve worked on PS2 and XBox360 hardware, so this was a bit of a change. It was a lot of fun, making things work with an almost minimalist approach. Just some reference material so I don’t lose the links, and because they may be interesting to some of you. I especially appreciate his comments on soloing, loose grouping, mission credit, combat roles and sector building/control. Like any good little RPG gamer, I have a notion that mana is some sort of magic power, perhaps derived from the land and channeled by mental or emotional focus. It’s typically a consumable resource, sometimes regenerating and infinite, sometimes finite. It’s neither creative nor destructive by nature, it is merely power, bent to the will of humans and monsters to varied ends. Until last week, I had no idea that Mana is actually an Oceanic concept, and that the notions of mana that I’ve grown up with are somewhat mutated. Of course, I knew that people have taken the concept of mana in different directions, whether it’s Larry Niven or SquareEnix. I just had the mistaken idea that the concept of mana was some gaming offshoot of Shinto beliefs. I guess that the concept of mana in the Final Fantasy games and the Mana series (of which Secret of Mana was one chapter, and is known as the Seiken Densetsu series in Japan) is somewhat influenced by Shinto beliefs, and the Oceanic concepts aren’t all that far removed conceptually, but seeing that there are Polynesian roots for the concept intrigued me. It does make me wonder why we don’t have some games digging into the Oceanic roots of the concept. Then again, I wonder why we don’t have a lot of other cultural storytelling in games. Yes, Valkyrie Profile was good, but even that was filtered through Japanese notions. That’s not necessarily a bad thing, but I would like to see some more games built a bit closer to the source material, from many different cultures. And yes, I’m probably missing some that are already made because they aren’t made in English. Russia is apparently hitting the world game stage harder a bit lately, with higher profile releases like King’s Bounty. Perhaps I’m just asking that American and Japanese devs look a little deeper into their sources, and treat them with more respect. To a degree, there will always be filtering, and to borrow a Trek concept, “it’s impossible for a non-Klingon to understand the Klingon soul”… but I do wish devs would try a lot harder. I do like a well-crafted fictional world, just as much as any other child who geeked out on Tolkien and Asimov, but even those two giants put in a LOT of study and a lot of thinking about ramifications and consequences. Far too many game devs are content to employ generic fantasy tropes, using a few buxom characters and some addictive mechanics to make FantasyDIKU#157 or GenericJRPG/WRPG #08976-B. New games need not be historic real-world riffs, but we would do well to see why real-world legends have persisted through cultures (oft times only through oral history mechanics), and how they offer stability to their populace. Games need not be realistic, but plausibility goes a long way to suspending disbelief. Great game storytellers understand sociology, psychology, history, theology, art, politics and all sorts of other aspects of the human condition. There aren’t many great game storytellers, at least, if the evidence of their work is any indication. 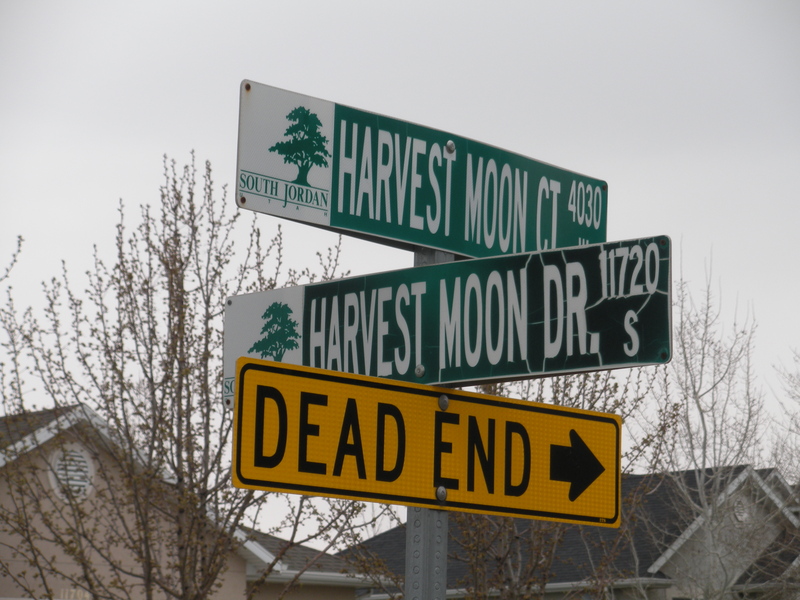 I happened across this street sign a bit ago, and couldn’t resist showing it here, considering our Harvest Moon discussions. Interesting that the Court is a dead end, but the Drive plows on through. There’s probably some deep meaning to that… but I’m not sure what it is. Following up on an intriguing tangent from the Data Mining comments, I wanted to take a look at the notion of Dual Specs and the “Holy Trinity of combat” that we see in World of Warcraft. It’s caused no small kerfluffle in message boards and blogs, and the inherent flexibility of dual specs is altering the perception of hybrid and “pure” classes. In a nutshell, each class has three “talent trees” that are more or less mutually exclusive when it comes time for character customization. Specialization in one tree means very little ability to adopt elements from another tree, so each tree more or less represents a “play style”. As such, each class has three major playstyles. (Yes, that grossly oversimplifies it in some ways, but I’m trying to keep this relatively “high level” design. Class identity is derived from these playstyles. The thing is, these three playstyles don’t necessarily map to different combat roles. (Those being the trinity; Tank/Damage Dealer/Healer.) A Rogue, for instance, will pretty much be a damage dealer no matter which tree she specializes in. A Druid, on the other hand, can be a tank, a ranged damage dealer, a melee damage dealer or a healer. (Yes, that’s four roles; the tank and melee damage dealer both fall under the Feral Combat tree.) Druids are inherently more flexible than a Rogue, able to fill more combat roles. As such, a Rogue and a Druid will have different value estimations of the ability to dual spec. The Rogue may well shrug and note that spec doesn’t significantly change their role, while a Druid now has the ability to switch between roles much easier than they once did. I happen to really like the ability to make that sort of choice, and to have two “main” specs to switch between. That said, it definitely has a way of watering down the roles of pure Damage Dealing classes, as they really don’t gain much flexibility from the dual spec system. Yes, they gain something, but it’s nowhere as significant as what a Druid or Shaman will stand to gain. Where’s the balance in that? OK, so lots of words to describe a known problem to most of you. Still, I like to give context to try to illustrate what I’m getting at a bit more clearly. Question: What if those three talent trees were mapped roughly to the trinity of roles (tank/DPS/healer) for each and every class? That would be the ultimate in “bring the player, not the class” design ethos that seeks to make WoW raiding more accessible to more players. Anyone can be anything, and can change mid-stride if necessary via the dual spec system. The obvious problems are the whole “if everyone’s Super, no one is” concern (the loss of class identity) and the thematic silliness of giving a Warlock of Warrior a healing role. I think the thematic concerns could be handwaved away if there really was a will to make this sort of mechanic reality. It would certainly be an exercise in creativity, but it could be done. Blizzard isn’t one to shy away from bending story and lore to mechanical ends. Mechanically, though, the greater questions are “should it be done?” and “how would it be done?” Splitting that pair, the “how” would again be fairly easy, comparing the two. Yes, it would likely mean coming up with ways for the classes to still feel different and unique, while still being able to fill different roles (meaning, a Warlock should heal differently from a Priest). That’s a trick, to be sure, but it’s doable. They are still making money with the game, right? …and as usual, WoW probably isn’t the best test bed for this sort of thing, since it’s the 800 lb. gorilla stuck in a rut of mud. Change doesn’t come easy to such a beastie. OK, then, what of Runes of Magic? The native ability to dual class there has at least superficial similarities to such a system, where a single player with any “core” class can be plenty flexible given the second class and spec builds. What of Darkfall or Ultima Online, with their skill systems and the ability to “build your own adventurer”? (Of course, those aren’t offering the same flexibility as dual specs in WoW, with the “change on the hoof” ability.) Could a new WoW killer distinguish itself that way? Still, I can’t shake the mental image of a Dual Wielding Warrior, holding aloft a pair of huge hammers that heal whomever they bop on the head. There’s precedent for that sort of action in the Final Fantasy world, and silly as it may seem, it’s actually a tactical advantage at times, since it doesn’t consume magic (or trigger magic related conditions, so it can slip past Reflect and the like) and can be built on the Warrior’s natural combat efficiency. (Rather than their typically pitiful magic proficiency.) If nothing else, that would give more ways to build itemization, which a gear-centric game will always love. Thanks to Ysharros for “foofery”, which I’m using here as a generic term roughly equivalent to “puttering around doing frivolous stuff”. I’m home sick today, coughing and sniffling way more than I want to. I’m better than yesterday, though, when I also stayed home from work. Bleh. I complain about the game industry on occasion, but I do miss my job. It stinks to be stuck at home like an invalid. I’m going to bust open our DVD player later to see if I can figure out why it’s not working, just so I can do something productive. That said, I’ve taken the time to catch up on some game demos that I’ve wanted to tinker with for a while now. It’s sort of productive, since I look at them as research projects, but at the same time… I just want to create sometimes. I take that as a sign I’m healing, since when I’m really sick, I just want to vegetate. Anyway, as the headline suggests, the core of my latest game demo binge is the little gem Fate by WildTangent. I like it. A lot. It’s the only one of the bunch that I’ve seriously considered buying. At its heart, it’s a Diablo clone. If you enjoyed those games, you would probably have fun with Fate. Yes, it’s endless monster loot pinata popping, but sometimes, that’s OK. I do complain about wanting more from my MMOs, but even so, it really is OK to have that sort of mindless Zen gaming as one of several options. Ultimately, though, I got sucked into Fate, finding it eating away my hours until I noticed it was almost 3 AM, and I had barely noticed the last three hours. Yes, that’s partially a function of my diminished mental capacity due to illness, and no, it’s not the best game in the world, but for a game that you can get for $10 and play for a long time, it’s good stuff.